Mari of Mevrouw cupcake chose Creme Brulee for this week's tuesday's with dorie recipe, however, time was not on my side this week so I opted out of the Creme Brulee and went for the oh-so-easy almost fudge gateau. Aside from being super easy to put together, this cake was delicious and as fudgy as can be with a divine taste. 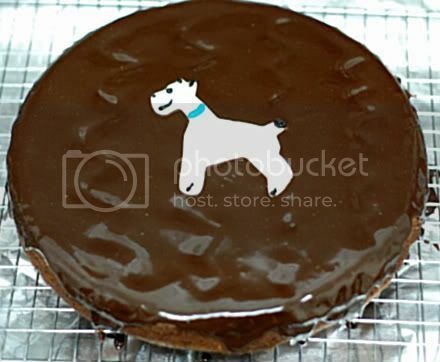 For fun I thought I'd make a fondant Schnauzer to top it off! All you have to do is scroll down my blog and see all my cute pups on the left hand side to know that I'm totally dog crazy! Next week I will most definitely go back on schedule and bake along with the TWD crowd. Next week's recipe: Caramel Peanut Topped Brownie Cake chosen by Tammy of Wee Treats by Tammy. You bet your toosh I'll be making that! Yum! As I mentioned in my previous post, September is a huge month for birthday's, apparently. My very very dear friend Julie celebrated her 27th birthday this past week and we all went out Saturday night to celebrate. I obviously couldn't show up empty handed, and by empty handed I mean dessert-less, so I thought it would be a fun idea to make some sort of brownie birthday cake bites. I'm convinced that every person I know was brought into this world during the month of September! 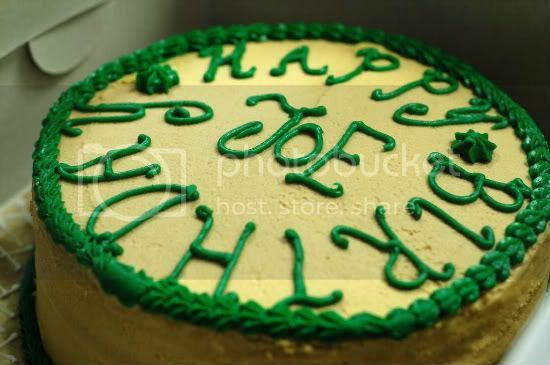 It's craaaazy how many close family members and/or friends share the same birthday month. Therefore, September birthday's=lots of celebratory desserts, compliments of me! My very dear friend and colleague celebrated a birthday last week and I insisted he pick his favorite kind of cake....which led me to caramel cake. 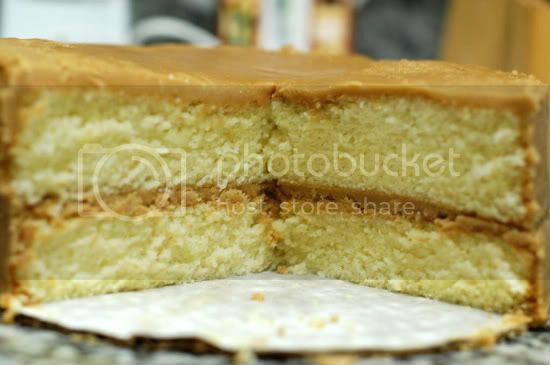 I made a caramel cake a few weeks ago from a cookbook I bought which was tasty, but I decided to go with Paula Deen's: "Bobby's Caramel Cake" this time to switch it up. If there's one thing Paula Deen knows, it's Southern food. 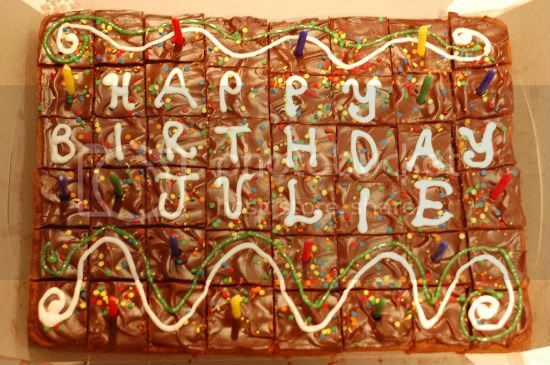 This was my first sheet cake! I've always wanted to make a sheet cake and there was no better time than to make it for a very special birthday! I used 2 thin layers of Billy's Vanilla cake baked in large jelly roll pans and filled the cake with chocolate buttercream. 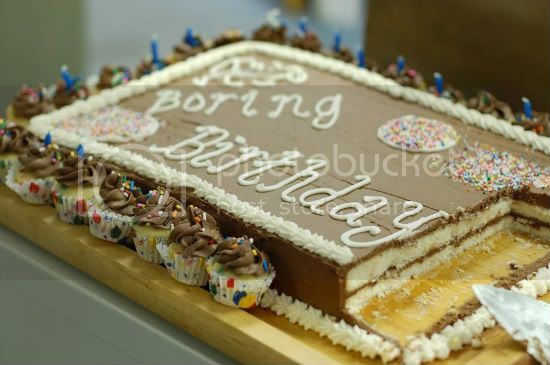 I piped shells all around the top and bottom borders, and because the theme of this cake was "boredom", I created 2 of the most boring circular sprinkle decorations imaginable. I mean, what the heck are those? 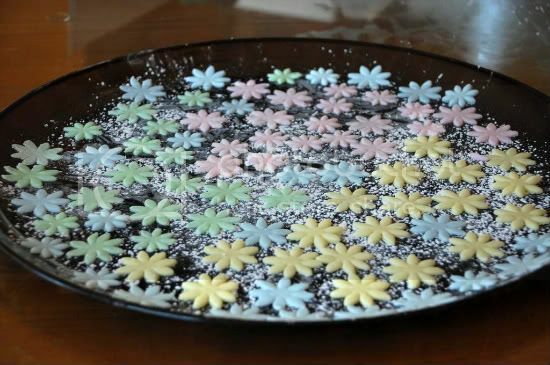 Sprinkle balls? Weird. Anyway, I'm totally hooked on sheet cakes now as they are so much fun to make! For an added fun element, I baked about 3 dozen mini cuppies topped with chocolate buttercream, sprinkles, and candles and strategically placed them around the perimeter of the cake. 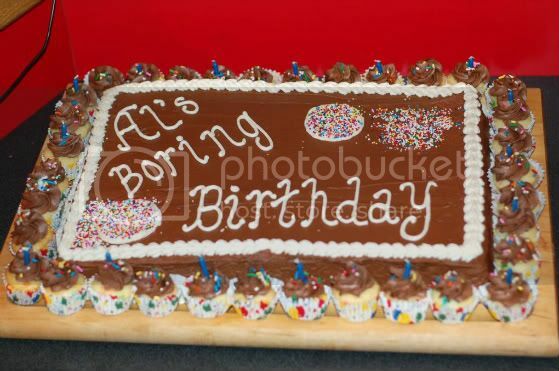 The cake was as delicious as it looked...HAPPY BIRTHDAY AL! "Wild about brownies" would be exactly how I'm feeling lately. Who doesn't love a super chocolaty fudgy dense brownie? I know I do! The most important brownie element that I require is density. 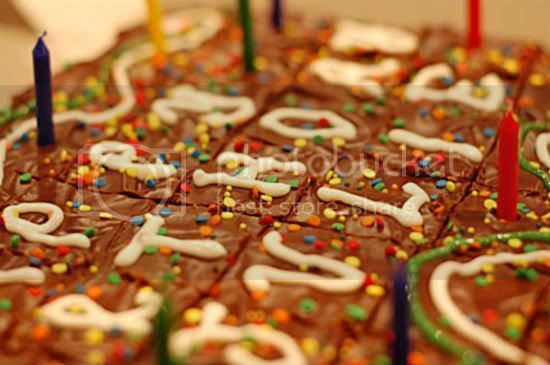 I absolutely can't eat a cake-like brownie; that's why cake and brownies are two separate entities! Anyway, I was going through my mother's super old cookbooks last weekend and snatched up so many great old cookbooks that aren't even printed anymore. I came across a brownie book that was loaded with, what seems to be, fantastic recipes. The first, and I assure you, not the last, brownie recipe that I chose from this book were called "Coffee Toffee Brownies." 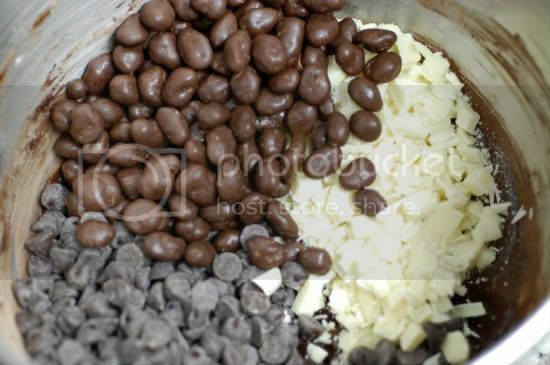 However, I played around with these and added white chocolate chips as well as crushed chocolate covered espresso beans. I wasn't sure how the combination of white chocolate, chocolate espresso, and toffee bits would go over but these were absolutely fantastic! People at work were calling them "poisonously dangerous". The actual brownie was sooooo fudgy, dense and rich. As if these weren't chocolaty enough, I added milk chocolate curls to the tops, mainly because I just bought a new "chocolate curling device" that I wanted to test out! 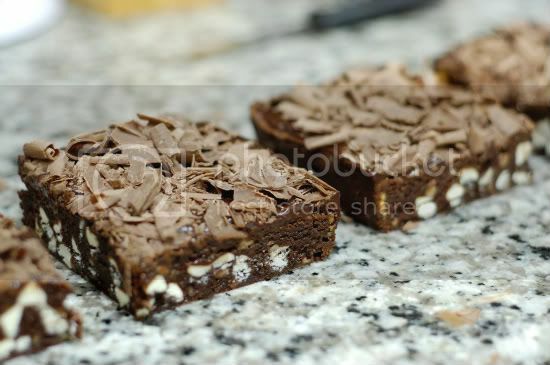 These were your quintessential brownies with a twist and I promise I will post the recipe at some point this week! These bars were AMAZING! 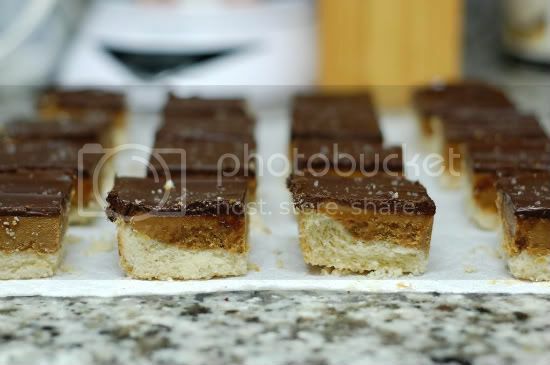 Shortbread crust, caramel middle with a luscious chocolate topping and sprinkled with salt were all these bars needed. Salt and caramel should be as synonymous as peanut butter and jelly. They add a perfect compliment of sweet and salty tastes with an added buttery crust from the shortbread layer. I couldn't stop eating these as they were probably one of my most favorite recipes to date. If you like sweet and salty I highly recommend you make these. So delish! I couldn't wait any longer! My pumpkin desire was burning inside of me until I just couldn't take it anymore! Fall is my most favorite time of the year, hands down. New York in the fall is absolutely gorgeous. I love the leaves, the colors, the brisk cool air, anything involving a scarf and most importantly all the wonderful flavors to be incorporated in cooking/baking. I love the tastes of pumpkin and all the amazing spices that go along with the season of Fall including cinnamon, cardamon, all-spice, nutmeg, etc. Ever since August hit, I knew Fall was right around the corner and promised myself that on the first day of Fall my seasonal baking will begin. However, clearly I couldn't wait another week so I began my Fall baking last night with these bars. I got the recipe from the Martha Stewart website and boy were these good. 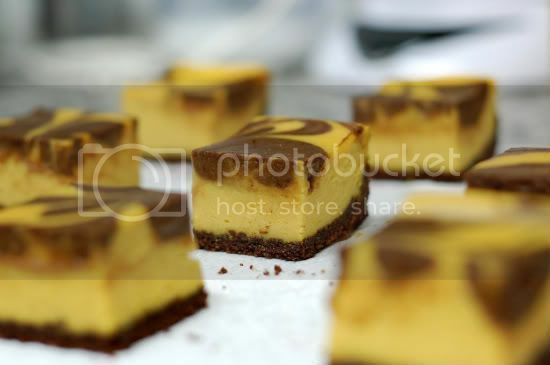 They baked beautifully and had a wonderful consistency made up of cream cheese, pumpkin, some spices and chocolate. Although I would have preferred a stronger pumpkin taste in these bars, they were a great starting point to build on for the season! I would highly recommend making these as everyone at work thus far has loved them! I bought the book, "Southern Cakes, Sweet and Irresistible Recipes for Everyday Celebrations" a while back and decided to finally flip through it over the weekend. I love love love any food-related recipes connecting to Southern cuisine so I knew this book would be right up my alley. I was debating between a lady Baltimore cake and this caramel cake and decided to go with the later. 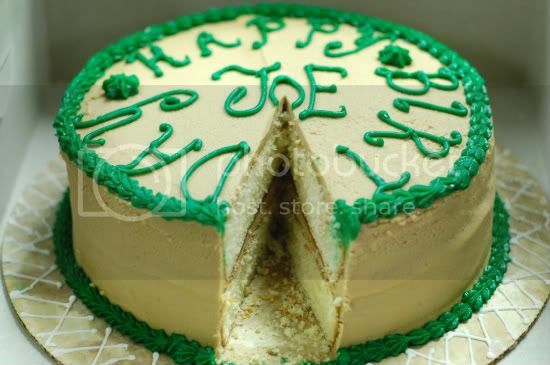 This was a relatively simple recipe involving 2-9inch yellow cakes bound by a sweet thick caramel frosting that hardens within seconds. 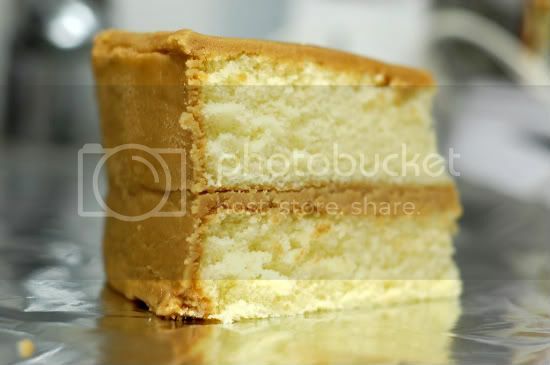 The yellow cake was very soft and light which really complimented the caramel crunch perfectly. I gave most of the cake to the guys in my Manhattan car garage and this morning they were all raving about it! I think these would be delicious as cupcakes! Stay tuned! 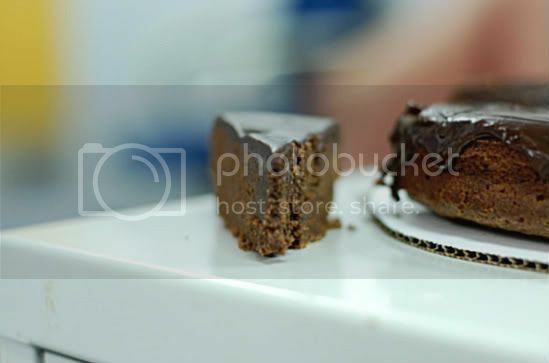 Thanks to Claudia of Fool for Food for picking this week's Tuesday's With Dorie recipe: Chocolate Chunkers. 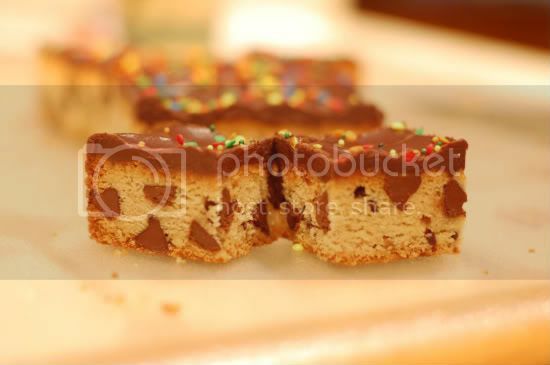 The last several weeks have been cookie recipes and I'm looking forward to baking the dimply plum cake next week! Finally, something in cake form! 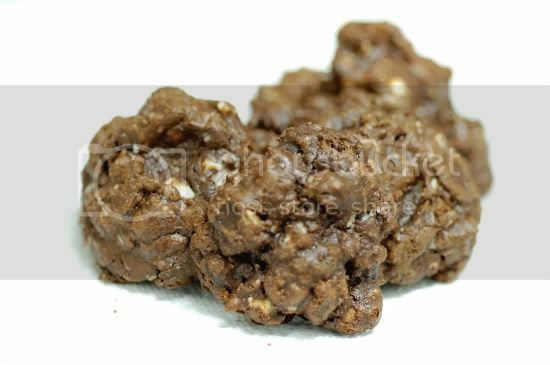 These cookies were an agglomeration of chunky white, semi-sweet, and milk chocolate clusters with a faint chocolate crumbly cookie base as a binder. The recipe called for raisins but instead I used Raisinets, because apparently the 19oz of chocolate wasn't enough in this recipe that I felt the need to add even more! 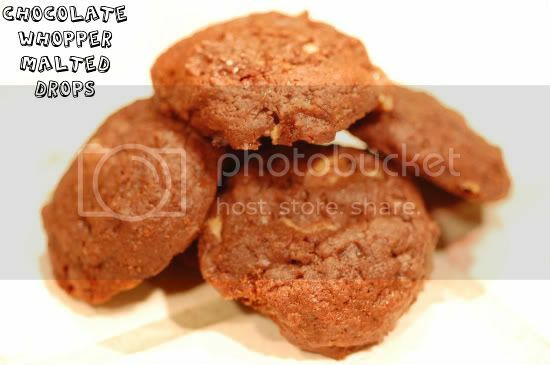 These cookies reminded me of Maida Heater's mulatos, which are by far my most favorite chocolate cookie. Where last week's cookie (chocolate malted whopper drops) lacked fudginess, moistness, and richness; this weeks recipe made up for it in a major way. These would be delicious with vanilla ice cream! Check out the TWD blogroll for all the other amazing cookie creations. This week's Tuesday's With Dorie recipe was chosen by Rachel at Confessions of a Tangerine Tart. 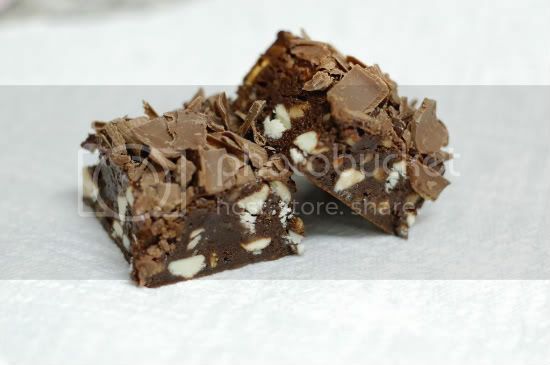 Although I'm a lover of malted milk balls, this recipe just didn't do it for me. Was it chocolaty? Sure. Was it chewy and soft? Most definitely. However, something about this recipe's final product just didn't reach my expectations! I guess I was expecting something more fudgy and gooey and instead I found them to be super dense and a tad bit dry. I went ahead and decided to be creative by replacing the malted milk powder with New York's own, Serendipity's Frozen Hot Chocolate powder mix. I felt like I was eating hot chocolate cookies! I'm looking forward to next week's recipe: Chocolate Chunkers. Cliff note: Chris-next week's recipe makes me think of your face. 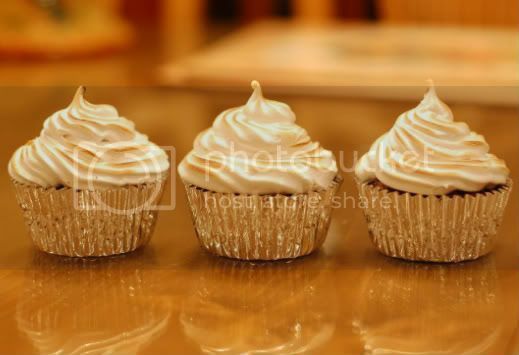 I've been wanting to make this Martha Stewart rendition of S'more cupcakes for a long time! This past Saturday seemed like the perfect opportunity as the Northeast endured the worst rainstorm I've seen in a while; remnants of hurricane Hannah. Saturday slowly presented itself as the perfect storm (no pun intended) for baking all day! The NY Mets were postponed due to the rain, my Miami Hurricanes didn't play until 8pm, and I physically couldn't leave my house for fear of drowning in my driveway. So, my mom, the dogs, and myself set out on a little baking adventure. 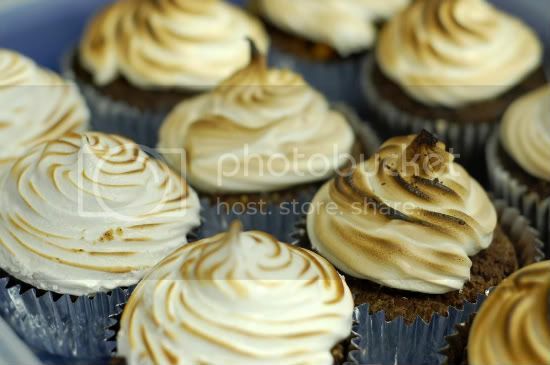 These S'more cupcakes were the first of three recipes we baked (more posts to come). I'm such a sucker for anything topped off with meringue. I can literally spoon this delicious, fluffy, cloud-like goodness right into my mouth! Top that off with a crunchy baked graham cracker bottom and chocolate cake filled with chopped chocolate chunks and I'm good to go. These were really delicious. If you are into S'mores then I definitely recommend you make these. The recipe is a tad bit involved as it requires baking the bottom crust first then filling with batter and baking again but it is well worth it. The marshmallow meringue is to die for. 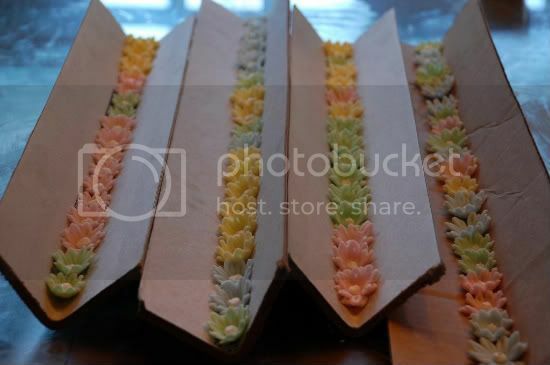 I used my mini kitchen blow torch for the tops, however, half-way through this process I was out of butane. I ended up using a BBQ lighter for the rest and that's why some look a little burnt...but, who doesn't like s'mores with a little extra browning? I know I do! Cupcake and Marshmallow Merengue recipe found here. Well, I did it! After an entire week of hard work it finally paid off! Little by little I pieced everything together last night to create a pastel masterpiece! The assembly of this cake took about 5 hours yesterday. Each tier is filled with chocolate buttercream while being iced with vanilla buttercream. 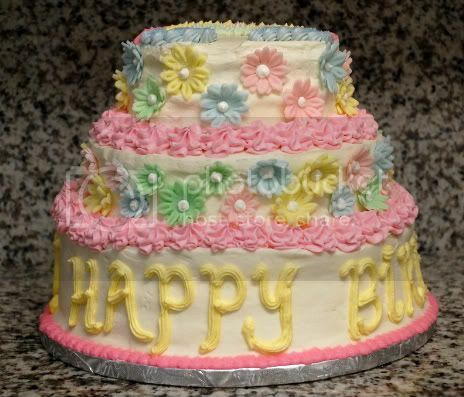 The biggest and bottom tier is 3 layers and the middle and top tier are each 2 layers. I was most nervous about the stacking of this cake which was my first experience. I was worried that I wouldn't center it properly thus creating smudges all throughout the cake, however, it was a huge success! 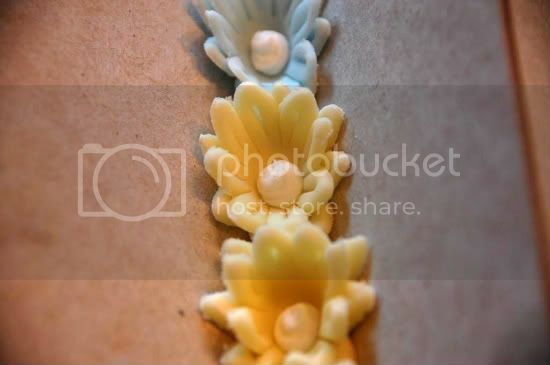 I piped pink flowers around the bases of each tier and, using royal icing as a glue, "pasted" the pastel flowers to the middle and top tier. I'm really excited to present this cake to the birthday girl! I hope she enjoys it as much as I enjoyed creating it! My cousin and her husband own a Cafe in Brooklyn and are going to sell my cupcakes exclusively! I've very excited about this! 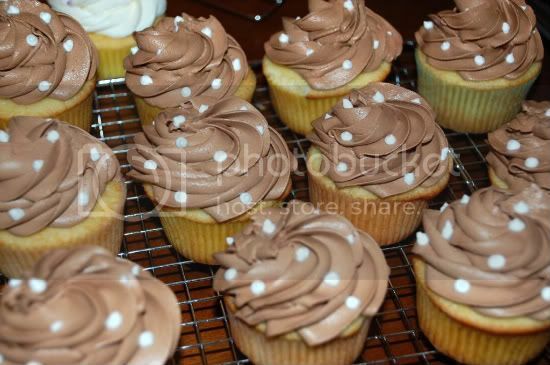 I wanted to start off simple by making vanilla cupcakes with interchanging chocolate and vanilla buttercream. I love the way the chocolate cupcakes look; so elegant! 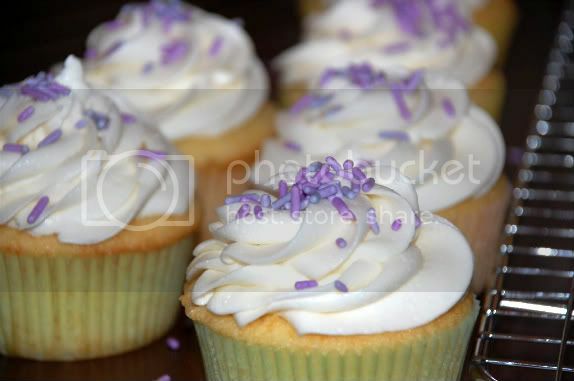 I sprinkled a little purple sprinkles on the vanilla cuppies. I hope these go over well! Enjoy!!! I took on a seriously overwhelming, but so far satisfying project as a challenge to myself and a test to my culinary skills! I plan to take y'all with me step by step. The project is to create a 3 tiered birthday cake for an 8 year old girl that include the pastel colors of yellow, pink, blue, and green. 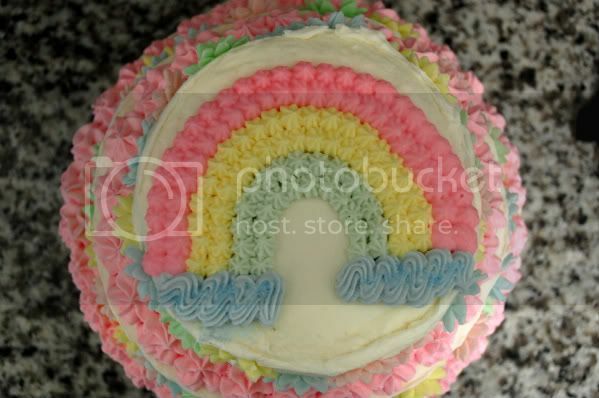 She wants flowers all over the cake as well as a rainbow on the top and chocolate buttercream as the filling. 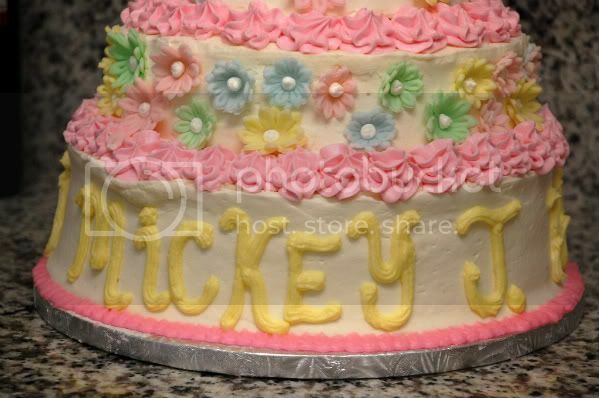 Her father insisted the cake be "busy" with decorations. I began this project last night and the cake is "due" tomorrow. I have such a crazy week this week that I really need to get going! I will assemble the cake later this week! 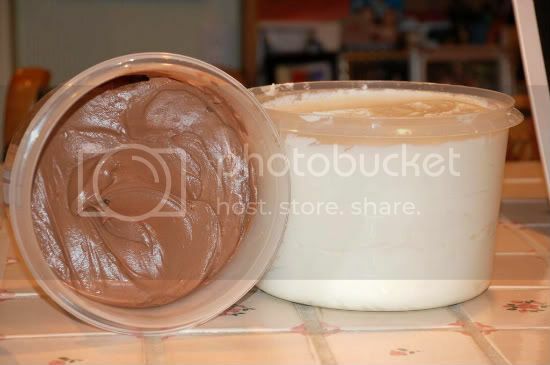 Next up was the buttercream. 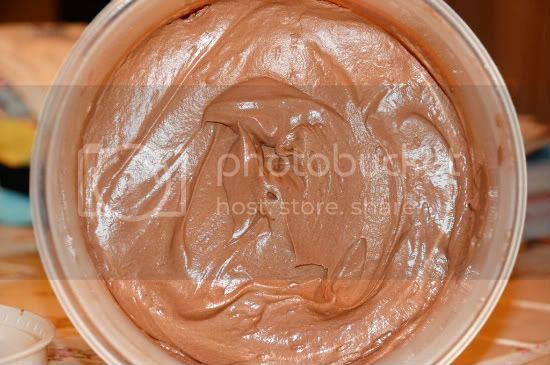 I've seriously never seen so much buttercream in my entire life! I just wanted to dive into it. The vanilla will be used to frost the top and outside of the 3 cakes and the chocolate will be used as the filling between the layers. Tomorrow I will be assembling the stacked cakes, frosting, decorating, and making the cake "busy". Stay tuned for final pictures tomorrow! Stefany of Proceed With Caution chose this week's TWD recipe: Chunky Peanut Butter & Chocolate Chipsters. The title alone had me salivating! I was excited to finally see a cookie recipe selected for both this week and next! 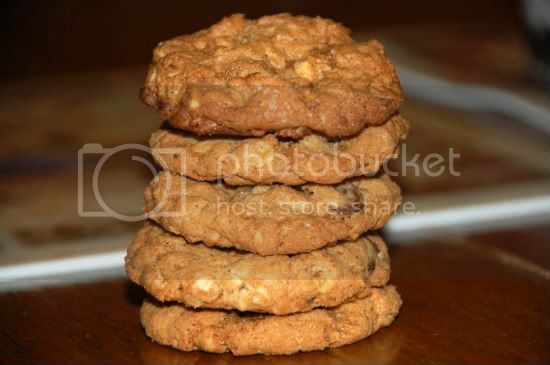 I considered this recipe your basic oatmeal peanut butter chocolate chip recipe with a bit of a twist. The recipe called for the addition of cinnamon and freshly grated ginger and while I was at it I added some nutmeg for kicks. These spices resulted in a delicious burst of flavor combined with the peanut butter and oats. I'm not sure exactly how these cookies were supposed to come out, but mine came out crunchy, buttery and super sweet. They were delicious! 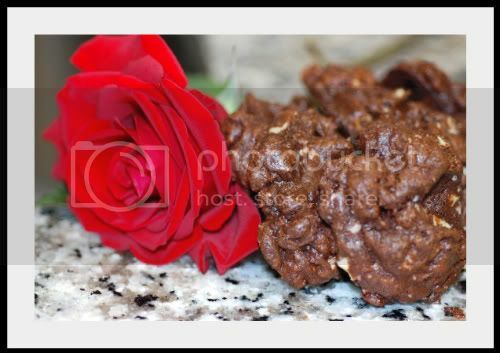 Check out the TWD blogroll to see all the other yummy cookies.